In Italy you know that Christmas is not far away when torrone – a kind of nougat – appears in abundance in shops and markets. Torrone is made from honey, almonds, pistacchi or hazelnuts, sugar and egg whites and both dark and pure white versions are sold. A form of torrone was known to the ancient Romans and Sicily has a version called cubaita, made from sesame seeds and introduced by the Arabs. Other regions of Italy have their own versions, too, and in Benevento [Campania] they flavour the sweet with Strega liqueur. In Cremona, on 25th October 1441, torrone was made for the marriage celebrations of Bianca Maria Visconti and Francesco Sforza. The Visconti family chefs decided to make a sweet in the shape of the city’s tower, the Torione and so the sweet that we all know derives its name. This year the city of Cremona celebrates its Torrone Festival, known as “Torrone e Torroni” from 19th – 21st November and there will be tastings, theatrical performances, music and special events thoughout the city. As Cremona is, of course, also famous for its violins, music will play a special part in this year’s festival and all the events will take place to the sound of the violin. The fun actually begins with a curtain-raiser event on the evening of Thursday 18th November: “the Curse of the Violin: the [Untrue] Story of the Invention of Torrone” will be a “whodunit” play which the audience will be invited to solve. On Saturday 20th November tourists can participate in guided tours of some of the city’s important buildings. 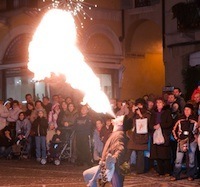 These are tours with a difference as they will be led by children, Cremona’s “piccolo guide” [little guides]. 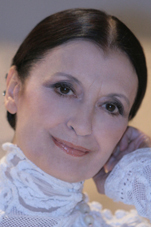 In the afternoon the “Torrone d’Oro” will again be presented to Carla Fracci in the town’s Piazza Pace. 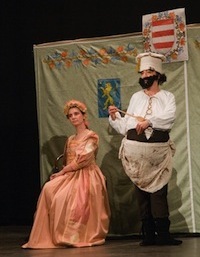 There will be a music quiz, outdoor cartoon exhibitions and at 16.00 the re-enactment of the Sforza-Visconti wedding will take place as a procession through the historic centre of the town. Also at 16.00 there will be an event called “Violino in Barrique”, a wine tasting during which the connection between the production of certain wines and the making of violins will be explained. There will also be a book presentation and a film show. On Sunday 21st November the cartoon exhibition and the “piccolo guide” visits will continue. The public will have a chance to participate in solving a giant crossword on festival themes in the Town Hall. From 11 am visitors will be able to see torroni made in the shapes of violins, musical notes and forming the titles of famous Italian songs. 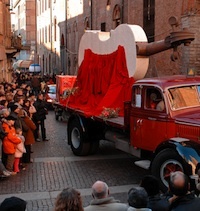 In the afternoon a giant torrone violin, over six metres long, will make its appearance in the town centre. There will be another opportunity to participate in “Violino in Barrique” and, at the Cremona Palace Hotel, visitors will be able to taste torrone and then work off the calories by dancing the tango! There will be a spectacular final display of dance, acrobatics and music at the Town Hall from 17.15 and a mandolin concert at 21.00. “Torrone Live”, a demonstration on the making of torrone, will take place on each day of the Festival at 14.30 and 20.00 at the Loggia dei Militi. So if you are looking for a pre-Christmas Festival to raise your spirits, this is the one!